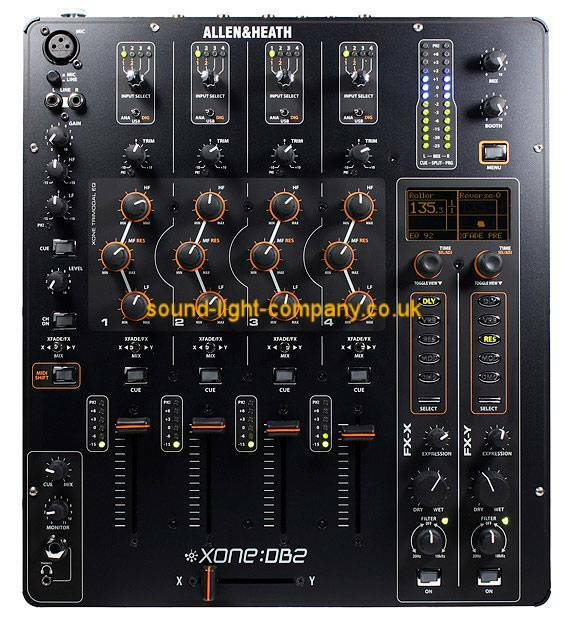 "The DB2 is a great-sounding mixer with some great features, at a cost. But if you don't love the feel of this mixer, we will eat our headphones!" Boasting a massive FX library of more than 50 FX presets divided into 5 FX types: Delays/loopers, Reverbs, Resonators, Modulators and Damage, Xone:DB2 allows you to dig deep and get hands-on with your music. From subtle FX washes to total transformation of your sound • you're in control. Xone:DB2 adopts the fresh approach to creative equalisation introduced on DB4. The EQs can be used in three different modes • standard asymmetric EQ (+6/-26dB), total Kill (+6dB/OFF with a 24dB/octave slope), or High-Pass/Low-Pass filter with adjustable resonance. Useful output processing tool for dealing with poor room acoustics, less than ideal speaker placement, as a diagnostic tool for phase imbalance, or as an effect to change the bass sound focus. Retro-fit Pro-X-Fade option kit for Xone:DB2. Pro-X-Fadeÿ uses 100% conductive plasticÿ tracks and a wider stem for extended fader life. Pro-X-Fade also allows the DJ to adjust both the feel of the fader and the cut-in point to suit their personal style. Speak to your approved Allen & Heath dealer or distributor for purchasing and fitting information.